Schools are formative environments where children’s identities grow and take shape. While many factors affect a student’s learning, healthy physical environments can play a big part as well. As designers, how do we create nourishing environments where children can learn and thrive? Studies have shown the positive benefits that air, acoustics and daylight have on learning, but recent evidence suggests the material quality of a space also impacts the creation of healthy learning environments. Blank walls do not elicit much in the way of a psychological or emotional response, but patterning and texture in natural materials can. Human minds understand wood texture as non-living, but still associate it with representations of living things. School interiors that feature wood and bring nature indoors provoke positive psychological responses similar to how trees elicit biophilic responses. Wood in classrooms has even been shown to reduce stress and heart rates in students; it is calming, but also engaging without being a distraction. At Gray Middle School in Tacoma, Wash., glue-laminated timber beams were salvaged from a demolished building, sanded and reused in the new school’s roof structure. When wood is used in finishes, environments are enriched both visually and tactilely. Such complex environments have been shown to increase performance on intelligence tests, while other studies have shown that people judge spaces more favorably when wood is present, perceiving wood interiors as warm, inviting and relaxing. A Japanese study further showed wood had influenced physiological and psychological health more positively than other materials. 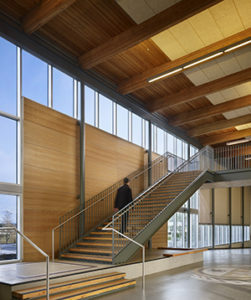 Mahlum Architects, with offices in Seattle and Portland, Ore., has used wood in school environments for many years to create aesthetically appealing spaces and to capitalize on wood’s inherent sustainability qualities. 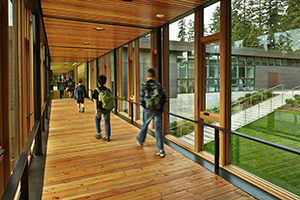 At Wilkes Elementary School on Bainbridge Island, Wash., wood comprises almost all interior surfaces: ceiling screens, glue-laminated beams, tongue and groove roof decking, window casements and interior relites, windows or translucent panels above doors or high in a partition wall intended to allow natural light to penetrate deeper into a building. The effect is a warm, enriching and open environment that connects classrooms out to the dense forest beyond. Wood can also benefit school communities when used as a building’s primary structural material. It can be less expensive to construct and has lower embodied energy and better environmental traits than other standard structural materials. At Gray Middle School in Tacoma, Wash., glue-laminated timber beams were salvaged from a demolished building, sanded and reused in the new school’s roof structure. The timber beams are prominently displayed inside classrooms as a reminder of the region’s timber industry. They also underscore the district’s commitment to the environment to reusing and recycling materials whenever possible. 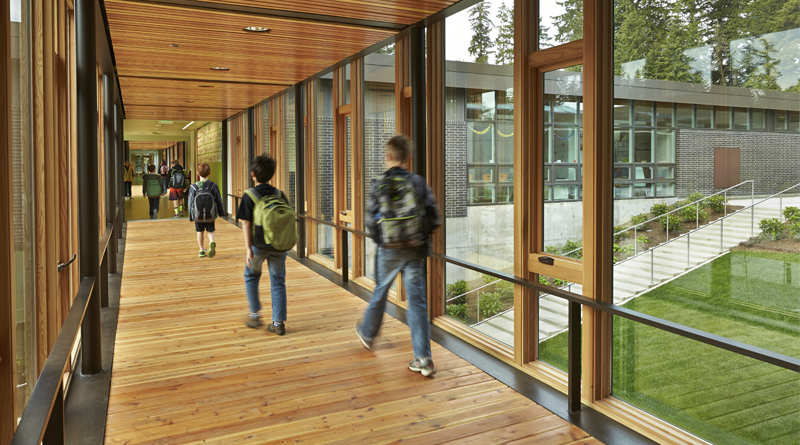 At Wilkes Elementary School on Bainbridge Island, Wash., wood comprises almost all interior surfaces. In addition to light wood framing, a new mass timber structural material called cross-laminated timber (CLT) is gaining popularity. Mahlum is using CLT in a series of three new classroom buildings in Washington State. The classrooms are part of a pilot project funded by the state to study CLT’s design and construction potential. “Demonstrating the effectiveness of CLT could stimulate the market for this innovative wood product in Washington State, create opportunities for manufacturing, encourage the use of locally produced wood and build rural jobs,” said Debra Delzell, PE, a project manager for Washington State’s Department of Enterprise Services. The therapeutic effects of trees and nature are well understood outside our buildings, yet inside our buildings wood and other natural materials can be used to create healthy, enriched, biophilic environments. When wood is used inside buildings, our senses are activated and perceptions heightened. Studies even suggest that surfaces made of wood can induce healing. As more emphasis is put on healthy materials, wood will be an increasingly relevant material for its sustainability and physiological attributes. Joe Mayo AIA, LEED AP, is an architect at Mahlum’s Seattle office, focusing on design for education and wood and mass timber applications. 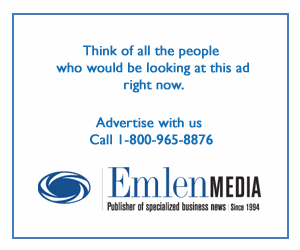 Read this story in its entirety in the March/April issue of School Construction News.